During their Uttar Pradesh yatra, Syed Firdaus Ashraf and photographer Hitesh Harisinghani discover Rahul Gandhi's plan to rebuild the Congress party in the state. No party, they say, can rule India without capturing Uttar Pradesh. But the politically crucial state -- with its 80 Lok Sabha seats -- is no citadel currently to any national party. Which is why Congress General Secretary Rahul Gandhi is trying hard to rejuvenate the Uttar Pradesh Congress party, which is in a terrible state. Rahul is going all out to reach out to the poor and downtrodden by inducting fresh faces into the party in the Mayawati-ruled state. Shailendra Singh is one such leader. A former senior deputy superintendent of police, Singh, 42, comes to the Congress headquarters in Lucknow every Tuesday. He calls Congress office-bearers from across the state and is in touch with almost every leader to get first-hand information about the state of the poor in Uttar Pradesh. "Tuesday is the day of tehsil divas in Uttar Pradesh where any villager can contact local authorities for their grievances. Our leader Rahul wants all Congress leaders to be present and help the rural poor if authorities don't act on their grievance. We carry a Congress banner in almost every village nearby and if the government does not act, we will," he says. But how can the Congress do that without being in power? With a smile, the answer comes: "The Right to Information Act." "This is a very powerful act. When Justice M A Khan was not acting on the complaints, we went to the Supreme Court and he was suspended from his job as the chief information commissioner. Scared of the RTI Act, bureaucrats work for poor people in the state," he adds. 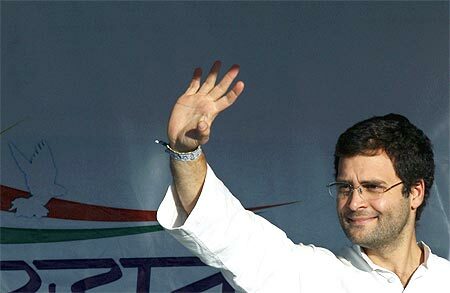 Like Singh, Rahul has roped in people from different walks of life, giving the Congress new faces among the people. Image: Rahul Gandhi knows only too well that the Congress can only capture power on its own in New Delhi if it grows in Uttar Pradesh.